Claudication, which is defined as reproducible ischemic muscle pain, is one of the most common manifestations of peripheral arterial occlusive disease (PAOD) caused by atherosclerosis. Claudication occurs during physical activity and is relieved after a short rest. Pain develops because of inadequate blood flow. Angiography is the criterion standard arterial imaging study for the diagnosis of PAOD. The image below depicts a superficial femoral artery occlusion. Peripheral arterial occlusive disease. 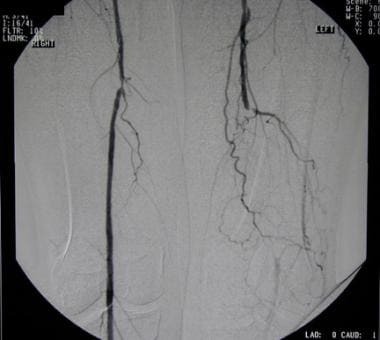 Angiogram shows superficial femoral artery occlusion on one side (with reconstitution of suprageniculate popliteal artery) and superficial femoral artery stenosis on other side. This is most common area for peripheral vascular disease. Examination of a patient with claudication should include a complete lower-extremity evaluation and pulse examination, including measuring segmental pressures. Attempt to palpate pulses from the abdominal aorta to the foot, with auscultation for bruits in the abdominal and pelvic regions. When palpable pulses are not present, a handheld Doppler device may be used to assess circulation. A useful tool in assessing a patient with claudication is the ankle-brachial index (ABI), which is a noninvasive way of establishing the presence of PAOD and is calculated as the ratio of systolic blood pressure at the ankle to that in the arm (normal range, 0.9-1.1; PAOD, < 0.9). A laboratory workup is helpful only for identifying accompanying silent alterations in renal function and elevated lipid profiles. For patients in whom medical and exercise therapy fail or those who have claudication symptoms that are lifestyle-limiting, surgical treatment includes either open bypass surgery or endovascular therapy (eg, stents, balloons, or atherectomy devices). Claudication, which is defined as reproducible ischemic muscle pain, is one of the most common manifestations of peripheral vascular disease caused by atherosclerosis (peripheral arterial occlusive disease [PAOD]). Claudication occurs during physical activity and is relieved after a short rest. Pain develops because of inadequate blood flow. For patient education resources, see the Circulatory Problems Center and Cholesterol Center, as well as Peripheral Vascular Disease, High Cholesterol, and Cholesterol FAQs. Single or multiple arterial stenoses produce impaired hemodynamics at the tissue level in patients with PAOD. Arterial stenoses lead to alterations in the distal perfusion pressures available to affected muscle groups. Under resting conditions, normal blood flow to extremity muscle groups averages 300-400 mL/min. Once exercise begins, blood flow increases as much as 10-fold as a consequence of the increase in cardiac output and compensatory vasodilation at the tissue level. This allows the increase in oxygen demand to be met. When exercise ceases, blood flow returns to normal within minutes. Resting blood flow in a person with PAOD is similar to that in a healthy person. In PAOD, however, blood flow cannot maximally increase in muscle tissue during exercise, because proximal arterial stenoses prevent compensatory vasodilation. When the metabolic demands of the muscle exceed blood flow, claudication symptoms ensue. At the same time, a longer recovery period is required for blood flow to return to baseline once exercise is terminated. Similar abnormal alterations occur in distal perfusion pressure in affected extremities. In normal extremities, the mean blood pressure drop from the heart to the ankles is no more than a few millimeters of mercury. In fact, as pressure travels distally, the measured systolic pressure actually increases because of the higher resistance encountered in smaller-diameter vessels. At baseline, a healthy person may have a higher measured ankle pressure than arm pressure. When exercise begins, no change in measured blood pressure occurs in the healthy extremity. In the atherosclerotic limb, each stenotic segment acts to reduce the pressure head experienced by distal muscle groups. Correspondingly, at rest, the measured blood pressure at the ankle is less than that measured in a healthy person. Once physical activity starts, the reduction in pressure produced by the atherosclerotic lesion becomes more significant, and the distal pressure is greatly diminished. where Q is flow, v is viscosity, L is the length of the stenotic area, and r is the radius of the open area within the stenosis. In this equation, the pressure gradient is directly proportional to the flow and the length of the stenosis and inversely proportional to the fourth power of the radius. Thus, although increasing the flow rate directly increases the pressure gradient at any given radius, these effects are much less marked than those due to changes in the radius of the stenosis. Because the radius is raised to the fourth power, it is the factor that has the most dramatic impact on a pressure gradient across a lesion. This impact is additive when two or more occlusive lesions are located sequentially within the same artery. Atherosclerosis affects up to 10% of the Western population older than 65 years. With the elderly population expected to increase 22% by the year 2040, atherosclerosis is expected to have a huge financial impact on medicine. Estimated PAOD prevalence in the general US population, based on National Health and Nutrition Examination Survey (NHANES) data, was 4.3%. Thus in 2000, about 5 million people in the US were affected by PAOD. That number increases with age; therefore, as the population ages the number of people affected by PAOD increases. When claudication is used as an indicator, it is estimated that 2% of the population aged 40-60 years and 6% of the population older than 70 years are affected. Intermittent claudication most commonly manifests in men older than 50 years. Although younger patients may present with symptoms consistent with intermittent claudication, other etiologies of leg pain and claudication (eg, popliteal entrapment syndrome) must be strongly considered. There seems to be a higher prevalence of PAOD in non-Hispanic blacks. Whether a patient progresses to limb amputation largely depends on the number and severity of cardiovascular risk factors (ie, smoking, hypertension, or diabetes). Continued smoking has been identified as the adverse risk factor most consistently associated with the progression of PAOD. Other factors are the severity of disease at the time of the initial patient encounter and, in some studies, the presence of diabetes. In an effort to identify patients at highest risk for progression to critical limb ischemia (CLI), a simple risk score for PAOD was developed: the Graz CLI score. Age and diabetes were among the most aggressive risk factors (respective odds ratios, 2.0 and 3.1). Selvin E, Erlinger TP. Prevalence of and risk factors for peripheral arterial disease in the United States: results from the National Health and Nutrition Examination Survey, 1999-2000. Circulation. 2004 Aug 10. 110 (6):738-43. [Medline]. Gary T, Belaj K, Hafner F, Eller P, Rief P, Hackl G, et al. Graz Critical Limb Ischemia Score: A Risk Score for Critical Limb Ischemia in Peripheral Arterial Occlusive Disease. Medicine (Baltimore). 2015 Jul. 94 (27):e1054. [Medline]. Norgren L, Hiatt WR, Dormandy JA, Nehler MR, Harris KA, Fowkes FG, et al. Inter-Society Consensus for the Management of Peripheral Arterial Disease (TASC II). J Vasc Surg. 2007 Jan. 45 Suppl S:S5-67. [Medline]. [Full Text]. Conen D, Everett BM, Kurth T, et al. Smoking, smoking status, and risk for symptomatic peripheral artery disease in women: a cohort study. Ann Intern Med. 2011 Jun 7. 154(11):719-26. [Medline]. [Full Text]. Yamasaki S, Izawa A, Koshikawa M, Saigusa T, Ebisawa S, Miura T, et al. Association between estimated glomerular filtration rate and peripheral arterial disease. J Cardiol. 2015 Nov. 66 (5):430-4. [Medline]. Dhangana R, Murphy TP, Coll JR, Ahn SH, Zafar AM, Qadeer FF, et al. Prevalence of abnormal ankle-brachial index among individuals with low or intermediate framingham risk scores. J Vasc Interv Radiol. 2011 Aug. 22(8):1077-82. [Medline]. Boyd AM. The natural course of arteriosclerosis of the lower extremities. Angiology. 1960. 11:10. Monaco M, Stassano P, Di Tommaso L, Pepino P, Giordano A, Pinna GB, et al. Systematic strategy of prophylactic coronary angiography improves long-term outcome after major vascular surgery in medium- to high-risk patients: a prospective, randomized study. J Am Coll Cardiol. 2009 Sep 8. 54(11):989-96. [Medline]. Bosma J, Dijksman LM, Lam K, Wisselink W, van Swijndregt AD, Vahl A. The costs and effects of contrast-enhanced magnetic resonance angiography and digital substraction angiography on quality of life in patients with peripheral arterial disease. Acta Radiol. 2014 Apr. 55 (3):279-86. [Medline]. Sommer WH, Bamberg F, Johnson TR, Weidenhagen R, Notohamiprodjo M, Schwarz F, et al. Diagnostic accuracy of dynamic computed tomographic angiographic of the lower leg in patients with critical limb ischemia. Invest Radiol. 2012 Jun. 47 (6):325-31. [Medline]. Gogalniceanu P, Lancaster RT, Patel VI. Clinical Assessment of Peripheral Arterial Disease of the Lower Limbs. N Engl J Med. 2018 May 3. 378 (18):e24. [Medline]. Ratchford EV. Medical management of claudication. J Vasc Surg. 2017 Jul. 66 (1):275-280. [Medline]. [Guideline] Gray BH, Diaz-Sandoval LJ, Dieter RS, Jaff MR, White CJ, Peripheral Vascular Disease Committee for the Society for Cardiovascular Angiography and Interventions. SCAI expert consensus statement for infrapopliteal arterial intervention appropriate use. Catheter Cardiovasc Interv. 2014 Oct 1. 84 (4):539-45. [Medline]. [Guideline] Society for Vascular Surgery Lower Extremity Guidelines Writing Group., Conte MS, Pomposelli FB, Clair DG, Geraghty PJ, McKinsey JF, et al. Society for Vascular Surgery practice guidelines for atherosclerotic occlusive disease of the lower extremities: management of asymptomatic disease and claudication. J Vasc Surg. 2015 Mar. 61 (3 Suppl):2S-41S. [Medline]. [Full Text]. [Guideline] Gerhard-Herman MD, Gornik HL, Barrett C, et al. 2016 AHA/ACC Guideline on the Management of Patients With Lower Extremity Peripheral Artery Disease: A Report of the American College of Cardiology/American Heart Association Task Force on Clinical Practice Guidelines. Circulation. 2017 Mar 21. 135 (12):e726-e779. [Medline]. [Full Text]. [Guideline] Aboyans V, Ricco JB, Bartelink MEL, et al. 2017 ESC Guidelines on the Diagnosis and Treatment of Peripheral Arterial Diseases, in collaboration with the European Society for Vascular Surgery (ESVS): Document covering atherosclerotic disease of extracranial carotid and vertebral, mesenteric, renal, upper and lower extremity arteriesEndorsed by: the European Stroke Organization (ESO)The Task Force for the Diagnosis and Treatment of Peripheral Arterial Diseases of the European Society of Cardiology (ESC) and of the European Society for V... Eur Heart J. 2018 Mar 1. 39 (9):763-816. [Medline]. [Full Text]. O'Donnell ME, Badger SA, Sharif MA, Young IS, Lee B, Soong CV. The vascular and biochemical effects of cilostazol in patients with peripheral arterial disease. J Vasc Surg. 2009 May. 49(5):1226-34. [Medline]. Momsen AH, Jensen MB, Norager CB, Madsen MR, Vestersgaard-Andersen T, Lindholt JS. Drug therapy for improving walking distance in intermittent claudication: a systematic review and meta-analysis of robust randomised controlled studies. Eur J Vasc Endovasc Surg. 2009 Oct. 38(4):463-74. [Medline]. Heart Protection Study Collaborative Group. Randomized trial of the effects of cholesterol-lowering with simvastatin on peripheral vascular and other major vascular outcomes in 20,536 people with peripheral arterial disease and other high-risk conditions. J Vasc Surg. 2007 Apr. 45(4):645-654; discussion 653-4. [Medline]. Samson RH. The role of statin drugs in the management of the peripheral vascular patient. Vasc Endovascular Surg. 2008 Aug-Sep. 42(4):352-66. [Medline]. Althouse AD, Abbott JD, Sutton-Tyrrell K, Forker AD, Lombardero MS, Buitrón LV, et al. Favorable effects of insulin sensitizers pertinent to peripheral arterial disease in type 2 diabetes: results from the Bypass Angioplasty Revascularization Investigation 2 Diabetes (BARI 2D) trial. Diabetes Care. 2013 Oct. 36 (10):3269-75. [Medline]. Rowe VL, Lee W, Weaver FA, Etzioni D. Patterns of treatment for peripheral arterial disease in the United States: 1996-2005. J Vasc Surg. 2009 Apr. 49(4):910-7. [Medline]. Antoniou GA, Chalmers N, Georgiadis GS, et al. A meta-analysis of endovascular versus surgical reconstruction of femoropopliteal arterial disease. J Vasc Surg. 2013 Jan. 57(1):242-53. [Medline]. US Food and Drug Administration. FDA approves first drug-coated angioplasty balloon catheter to treat vascular disease [press release]. October 10, 2014. Available at http://www.fda.gov/NewsEvents/Newsroom/PressAnnouncements/ucm418455.htm. Accessed: October 14, 2014. Harwood AE, Cayton T, Sarvanandan R, Lane R, Chetter I. A Review of the Potential Local Mechanisms by Which Exercise Improves Functional Outcomes in Intermittent Claudication. Ann Vasc Surg. 2016 Jan. 30:312-20. [Medline]. Atherectomy for peripheral vascular disease. Procedure performed by John Tonkin, MD, Halifax Health, Daytona Beach, FL. Video courtesy of BroadcastMed (http://orlive.com/halifaxhealth/videos/atherectomy-treatment-for-peripheral-vascular-disease). Peripheral arterial occlusive disease. Measuring segmental pressures. Peripheral arterial occlusive disease. Procedures performed during acute admission for peripheral arterial disease in US from 1996 to 2005. Reprinted from Journal of Vascular Surgery, Vol 49(4), Rowe VL et al, Patterns of treatment for peripheral arterial disease in the United States: 1996-2005, Pages 910-7, Apr 2009, with permission from Elsevier.